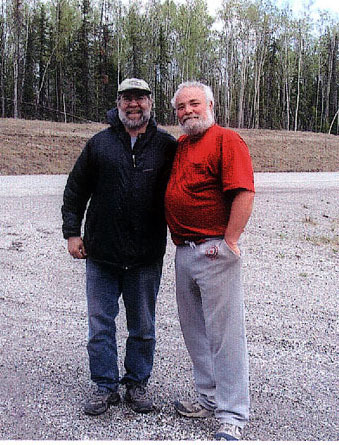 Well, I'm 38 miles south of Watson Lake, My good friend Gary Hanson has been with me since last Sunday night. It's been so cool. Just having someone to chat with really helps the day go by faster. Bugs are starting to be a real problem. BUT, I have a brand new bug jacket and it works just fine. Sort of settling in to an 18 mile day. Think I'll do four or five twenties between now and Johnson. I'd like to get in early enough to dash in to WHSE for river supplies. Looks like a June 7th arrival at JC with a departure on the 8th. Party at the campground and motel on the 7th. Say around 7-8 ish? Less than 240 (400km)miles to go. Owoooooooooooooooooooh! Then sixty to 80 days of camping out along the Yukon and Teslin rivers and of course the Norton Sound on the Bering. Whoa, some aspects of the water stuffs makes me a little nervous. Mainly negotiating the Yukon Flats area. They say it's difficult to find your channel because of all the islands etc... easy to take the wrong one. Have no fear. Even when I didn't have thousands of islands to weave through I manage to get lost. So I bet that I still have that ability. Adds to the adventure. Owoooooooooooh! Looks like a sunny day. Time to get going. The walk from Toad River to Liard Hot Springs is mighty fine. The northern Rockies still blow ya away. I know there's a gillion ships in town on the 7th but if anyone can, come on up to JC. I'll be sending in another report before I hit JC and Jeff Brady will have the latest info as well. Until then..take care and keep on howling. 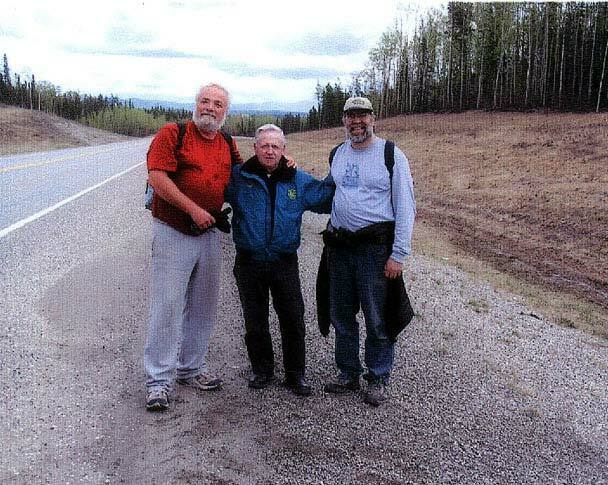 Floyd Matthews, center, caught up with Buckwheat and Gary Hanson on the Alaska Highway about 35 miles south of Watson Lake on May 25th.